The former CEO of a middle market aerospace company wished to pursue a business plan focused on manufacturing electronic components, a market niche where M&A Capital had past experience. The CEO approached M&A Capital to both assist in developing the operating strategy and raise capital to execute the plan. The operating strategy included making acquisitions in a niche market in the aerospace industry, which required identification of a strong financial partner to enhance the new venture’s credibility as a buyer. During the initial months of M&A Capital’s engagement, we assisted the CEO in identifying multiple acquisition targets that had intellectual property sufficient to act as a platform company. After identifying several hundred targets, we worked with the CEO to identify and meet with the most suitable. 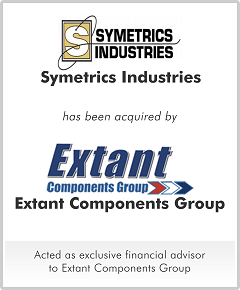 Ultimately, the CEO selected Symetrics due to the company's ability to produce quality electronic components, long term customer and supplier relationships and strong employee culture.